Ernst Waldfried Josef Wenzel Mach was born in Brno, Moravia, Austria. He was an Austrian physicist and philosopher, noted for his contributions to physics such as the Mach number and the study of shock waves. His early work focused on the Doppler effect in optics and acoustics. As a philosopher of science, he was a major influence on logical positivism, American pragmatism and through his criticism of Newton, a forerunner of Einstein's relativity. He received his doctorate in physics from the University of Vienna in 1860. 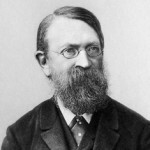 In 1864 he took a job as Professor of Mathematics at the University of Graz. In 1867, he took the chair of Experimental Physics at the Charles University, Prague, where he stayed for 28 years.